Fairytale castles, gorgeous nature, unique culture, historical towns - Germany is an outstanding European destination to set off on a journey to. 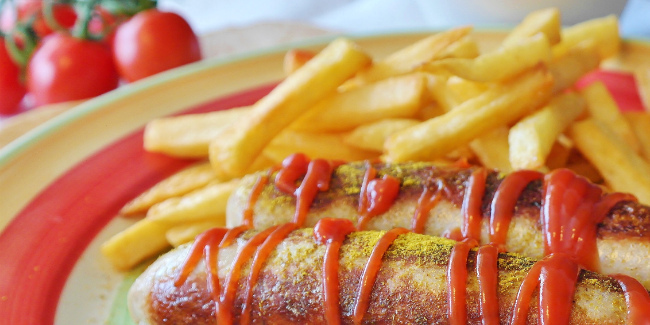 Luckily, yummy German cuisine is just as rich as the country's heritage. In this piece, we'd like to take a closer look at the delicious things to eat and drink during your Germany travel. First thing's first, it must be mentioned that the gastronomy in Germany varies depending on region and is quite diverse. In general, traditional cuisine tends to have "heavy" high-calorie foods and recipes dominate the menu. Of course, the number one dish to taste in Germany is the legendary Wiener Schnitzel, this delicious flat meat, often veal, is a "must". Grilled or fried German sausages, such as Bratwurst and the renown Currywurst, are a great choice as well. Roasted Sauerbraten made of different meat is surely among the unmissable German food dishes to have while you're visiting the country. Apart from meat, potatoes are among the basics too, thus local dumplings, fries, and Bratkartoffeln are a perfect fit and side dish. As for snacks, make sure to stop by a bakery to taste a large German Pretzel. The origins of this salted pastry go way back and are highly popular in numerous German regions, especially in Bavaria. Often served as an appetizer, they are usually soft and large, similar to bagels. For dessert, save some room for a mouth-watering rum cake, called Rumkuchen. You won't go wrong by having a slice of the delicious Black Forest cake either. This traditional chocolate cake with a sweet cherry filling is among the most authentic German dessert recipies. Contrary to common belief, the most popular drink of Germans is actually coffee, not beer, not wine, nor any other! Didn't see that one coming, huh? German drink culture is very developed and varied, therefore, you'll definitely find a beverage to complement your meal or brighten up your evening after a day of rich sightseeing. Numerous popular cocktails are made with the base of Brandy, cognac, and German liquors, we advise tasting the cocktail Asbach Alexander. A sip of refreshing German punch, called Bowle, or some Apfelwein apple cider (a Frankfurt specialty) is a great idea as well. Plus, who hasn’t heard of Schnaps? A shot of this fruity beverage is a must-do. And those who plan to go to this country during the Christmas season should surely taste the local winter specialties: mulled wine, which they call Gluhwein, as well as the special hot wine plus rum punch, Feuerzangenbowle. A glass of fine German wine is for sure something you should have during your Germany trip. The country is #10 among the planet's biggest wine producers and there's a total of 13 German wine regions, the most famous of them is Franconia. Moreover, the region of Baden-Baden allures travelers not only with its healing thermal areas and the Black Forest but also with its high-class wine. The tradition of wine-making in Germany boasts centuries of history. Among the wine highlights of the country are the white Riesling wine, the red Spätburgunder, and sweet ice wine called Eiswein. If you're among the people who prefer the bubbly, treat yourself to some Sekt. The overview of German drinks, of course, wouldn't be complete without the mentioning of beer. This beverage has for centuries been integral in Germany as back in the day it was even considered beneficial for health purposes. Not many people know this but before the 20th century water in Europe wasn’t always pure and safe to drink, thus its further processing, for instance, in breweries was not only a craft, it was somewhat a necessity. Nevertheless, German mineral water is of great quality today. It's no surprise that among the world’s beer nations, Germany proudly ranks among the top positions. Not only do locals annually consume about 100 liters (about 26 gallons) per person on average but they are also proud of the country's shocking number of around five thousand German beer brands. Among the best-known ones are the German beer Steins, Paulaner, Kolsch (produced in Cologne), Augustiner, Berlin's Berliner Weisse, Erdinger, Bavarian Hefeweizen, and numerous German Pilsners are just the tip of the iceberg. Apart from the big names, "Bier" enthusiasts are also welcome to taste many of the types of beers crafted in small breweries across the country. There are about 1500 of them dotting Germany, therefore, no matter which part of this European beauty is on your travel radar, you'll always have a chance for unique high-quality beer tasting. And by "high-quality" we really mean the real deal thing as the German law of beer purity, Reinheitsgebot, which has been around for about 500 years, states that if the drink isn't made only of water, yeast, hops, and barley, it’s not beer. What does that mean? That ordering German beer even in a small privately owned brewery somewhere in the tiniest village you avoid artificial components. Basically, no trip to Germany would be complete without a glass of local beer, there are even special German beer tours! Not to mention the beer event which has gained world popularity and welcomes thousands of visitors from across the globe, the famous German beer festival, Oktoberfest, held every year in the Bavarian city of Munich in autumn. And it's needless to say that it is by far not the only beer fair and festival in Germany which you can visit. A trip to Germany is certainly an experience you'll remember for years in terms of pretty much everything: gastronomy, sightseeing, culture, and more. Browse our Firebird selection of tailor-made Germany vacation packages and don't hesitate to contact our expert travel specialists who'd love to help you build the perfect worry-free program you've been dreaming of.